The Guerrilla Girls - Is It Worse In Europe? The Guerrilla Girls bring their grassroots form of anti-establishment activism to Europe, questioning the ethical practices and diversity of our museums and cultural institutions. After many years of holding America’s museums to account, The Guerrilla Girls are still ‘not ready to make nice.’ As one of the most instantly recognisable feminist art movements, The Guerrilla Girls have dedicated their activism to lobbying for the representation of minority groups in cultural institutions. Their methods have been mostly implemented outside of a gallery setting, adopting DIY methods popular in feminist activism such as flyering and public speaking. They significantly choose to remain anonymous, instead wearing gorilla masks and symbolically labeling themselves as prominent female artists including Gertrude Stein and Frida Kahlo. Their past work has asked uncomfortable questions regarding the representation of female artists, particularly their most famous work Do women have to be naked to get into the met museum? pointing out that whilst 85% of nudes in the New York Metropolitan Museum were female, only 5% of artists exhibited were women. This time, the Guerrilla Girls have chosen to show their work in a gallery, marking their first European exhibition. However, they are not ready to go easy on Europe, positing the question Is it even worse in Europe? as the title of the exhibition. 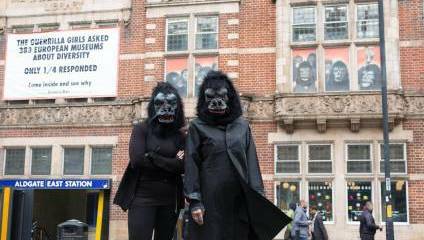 The Guerrilla Girls sent a survey to 383 arts institutions across Europe, questioning each about diversity and ethical concerns in museum practices. Just a quarter replied, and their responses make up the bulk of the exhibition. Those who didn’t reply are listed on a panel on the floor, which you are ‘free to walk over as you wish’, one of the few moments of protest in an otherwise more measured and stats based exhibition. To say that there is a variation in responses would be an understatement, from the serious to the jovial, the culturally concerned to the political, the polite to the slightly hostile. It suggests that cultural institutions are subject to significant uncertainty from two main sources, their own representational practices and the nature of museum funding. For the Guerrilla Girls, the question of minority representation and elitist museum funding practices go hand in hand. But it is clear from the responses that funding is a primary cause of anxiety. The ‘increasing privatisation of the public realm’ as one gallery director from Modern Art Oxford describes, compromises the museum’s ability to offer art to all, and there is a sense of having to focus on landmark exhibitions on famous names rather than supporting and cultivating more cutting-edge work. Naturally, many of the most famous individuals in the art world are white artists (as many as 77.6% of professional US artists are white as this 2014 study shows, so the cycle continues. The exhibition is statistics heavy, and we learn that only 14 museums have more than 20 artists from outside Europe and the US in their collections. There appears to be a distinct caginess and underlying guilt surrounding the lack of diversity in museums, with some suggesting that they do keep track of internal statistics regarding representation, yet still featuring over 80% of male work in their exhibitions. Although it makes for slightly depressing reading, there is evidence of museums being aware of the problem and improvements in diversity, such as Poland’s cultural institutions, which far surpass any other European country in terms of diversity. The exhibition is undoubtedly a fascinating and necessary insight into museum practices. In terms of The Guerrilla Girl’s own influence and the power of feminist activism, there are times when it feels like this does not quite show through. Although the point of their activism is to remain anonymous, the exhibition would have benefited from more of their trademark bold visual imagery and statements. Generally there is a sense of restraint, a lack of anger and boldness that we would associate with them. This is covered in a brief video of the collective’s history before you walk into the main exhibition room, but it would have been more engaging to see references to their methods of activism and political protest history all the way through. Otherwise you are faced with a wall of scribbled questionnaires and some panels of information, which although they certainly do a good job of condensing, cannot quite reflect the power of The Guerrilla Girl’s grassroots activism. Still, this is a crucial exhibition for anyone interested in critiquing the museum experience, which often can feel so neutral and extracted from political and socio-economic systems, and does an important job of acknowledging that there is still much work to be done. The Guerrilla Girls runs until March 5 2017 and is free entry. Find out more here.